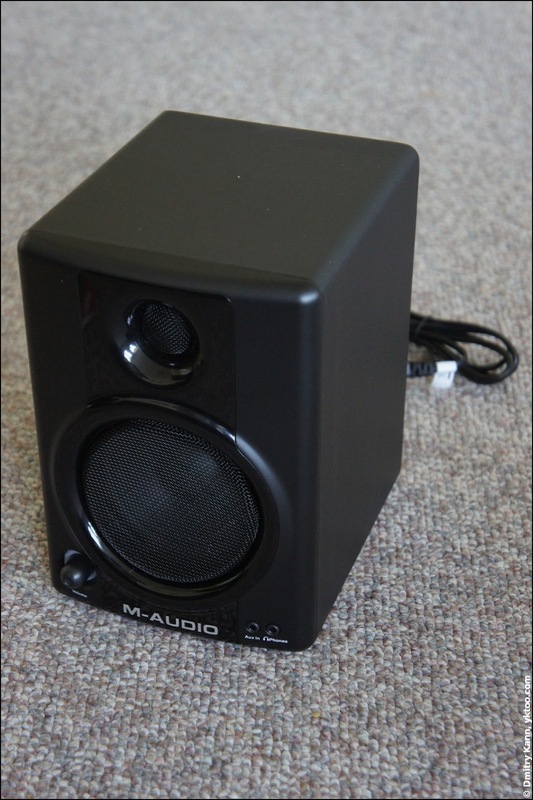 And one day I've decided to get hold of a pair of decent standalone, compact and powered (no more amps) speakers. 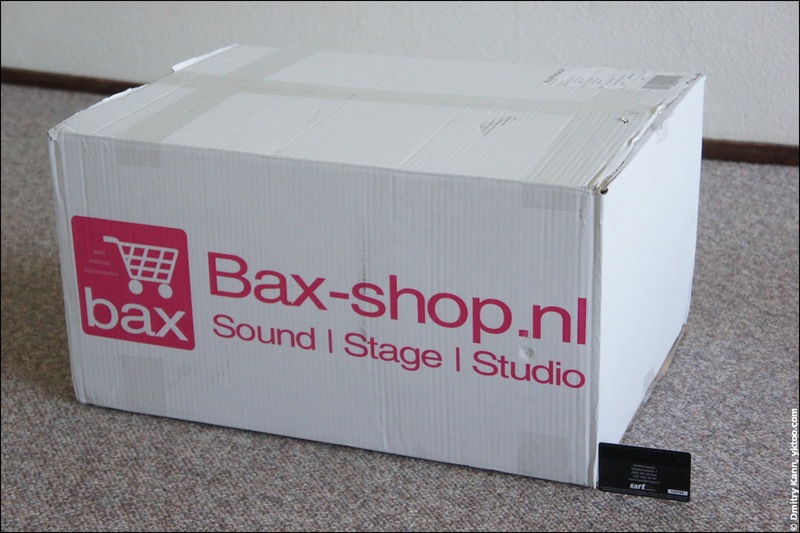 I've test-driven a whole bunch of desktop speakers at the store, and my conclusion is that you can't count on any decent sound experience below 200 euros. Except, maybe, Harman Kardon SoundSticks III (prices start at € 150), but I personally dislike 2.1 setups (with a subwoofer). I'm not using lowest basses to torment my neighbours, nor am I into drum'n'bass. And I don't want an extra box under my desk either. The range of 200—300 euros is dominated by Bose, completely overpriced in my opinion. I never liked their speakers for they sound flat and unnatural. 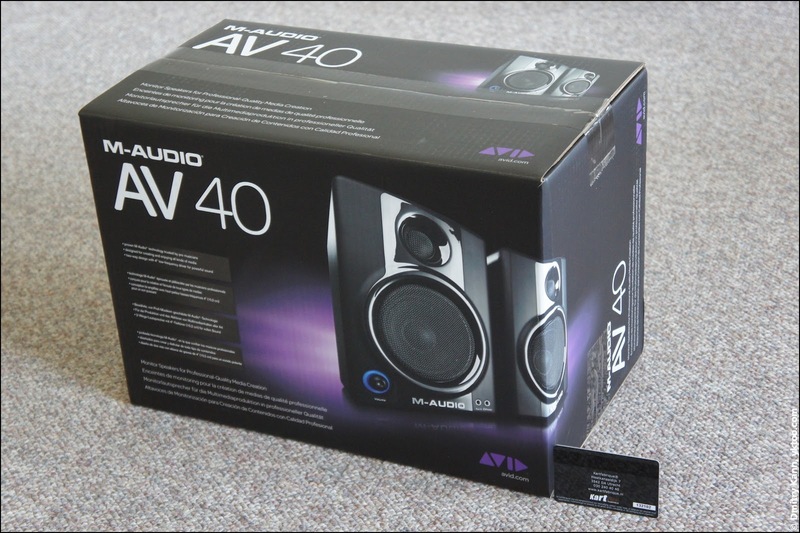 Speakers between 400 and 500 sound good, but I think it's lame to pay this price for PC speakers. 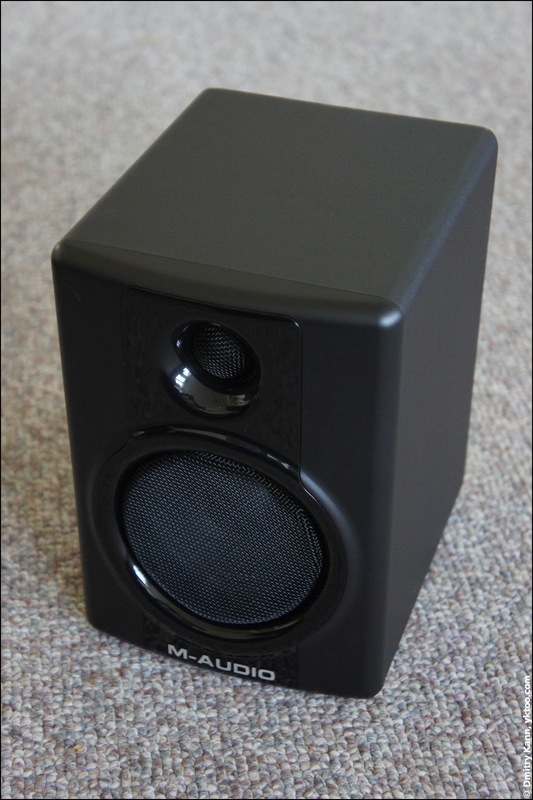 Eventually I stumbled upon M-Audio Studiophile AV 40 studio monitors, very well acclaimed. 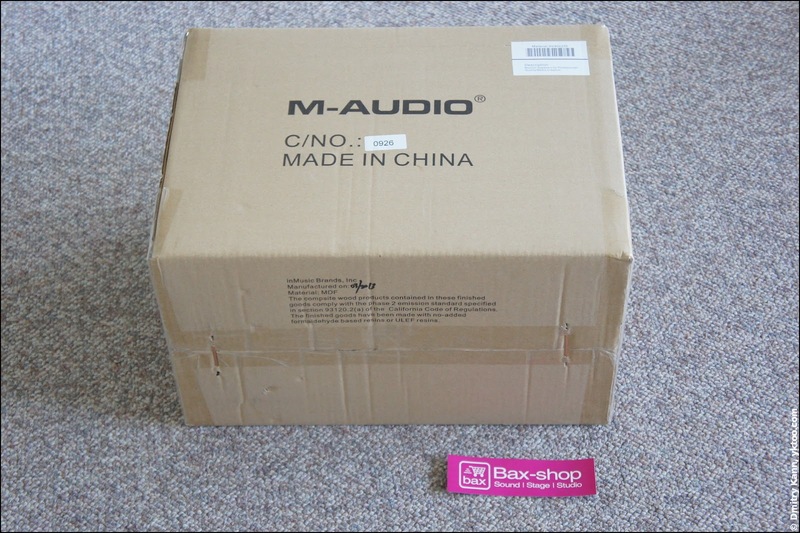 Apart from that, I'm familiar with M-Audio gear from my past studio experience, it's very well known and reputable. And all that at a very affordable price. I bought them from an e-store for € 109, including delivery. Their design is not a masterpiece of course, no mahogany nor dragon skin, but I don't care for the sound is king. The store claimed risk-free 60 days trial period, so I've decided to give it a try. A smaller box, all wrapped in bubble-pack, was found inside. 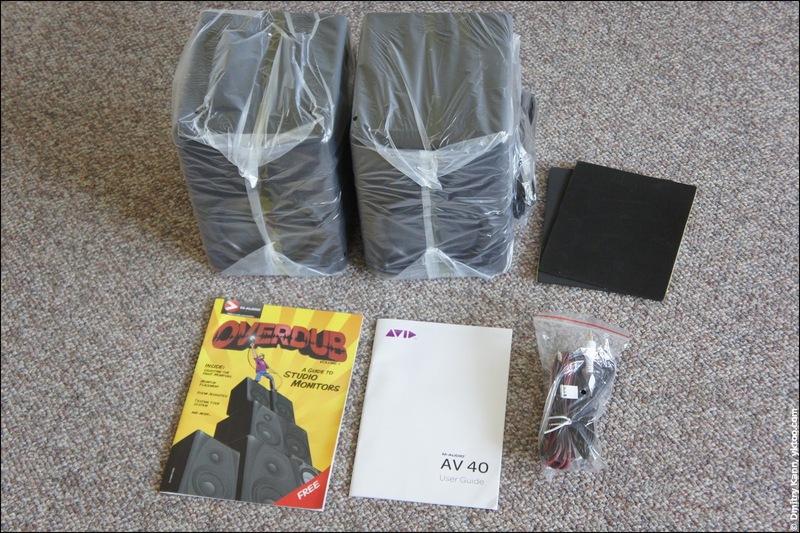 The left speaker is the main one as it contains a power amplifier. 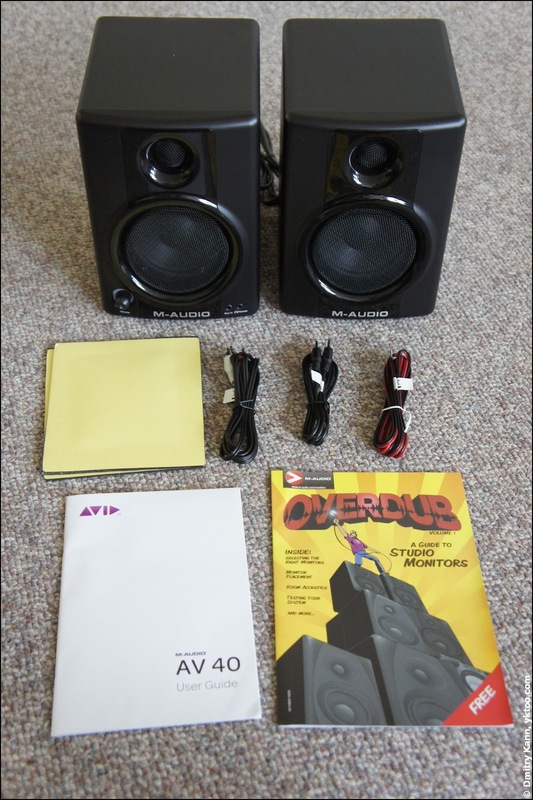 The front side contains LF and HF drivers (or tweeter and woofer, respectively), a volume knob with a blue power LED ring around it, auxiliary input (Aux In) and headphone output, both are 3½ mm jacks. I don't mind the power switch on the back. My speakers power up automatically when the PC is turned on, thanks to a master-slave power switch. What I find great is that the power adapter is built in, so no hassle with a separate AC adapter. 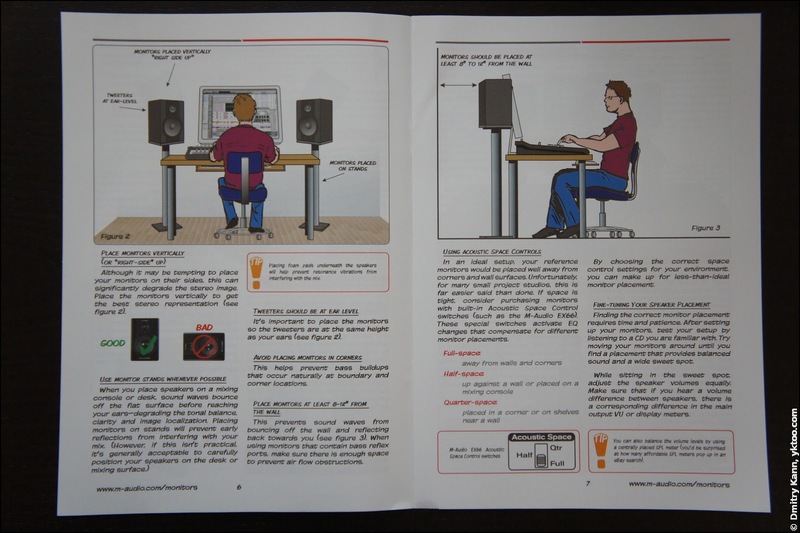 The included guide to studio monitors turned out to be very useful and interesting. 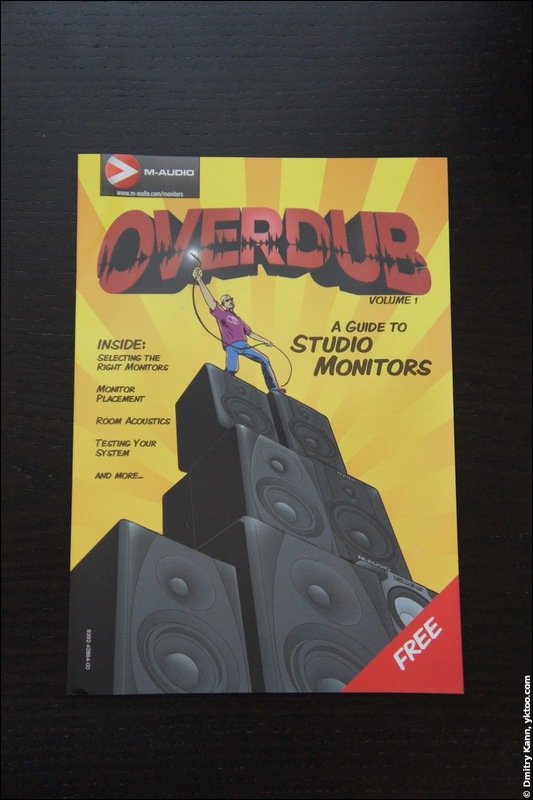 Surprisingly enough, there's almost no M-Audio ads inside, but rather practical recommendations on placing monitor in the room, eliminating vibration interference etc. After I've finished it, it became clear to me that my setup cannot be perfect. 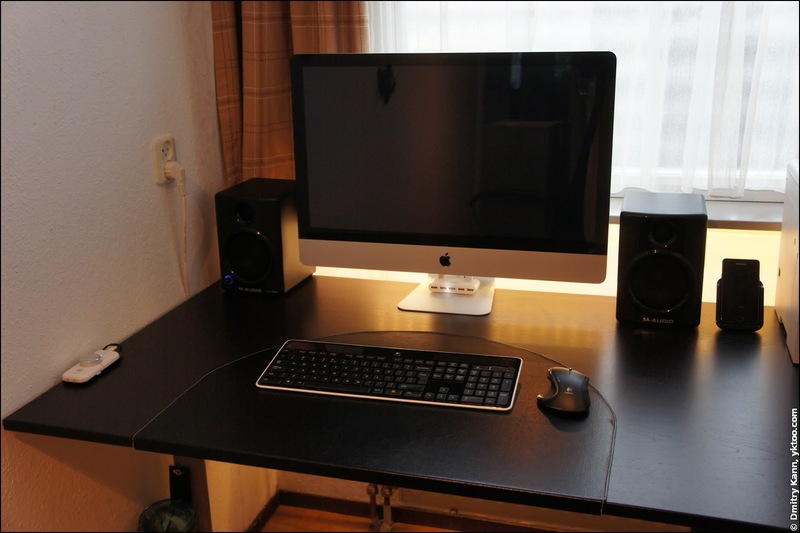 One should use monitor stands, put them at least 8" away from the wall, level it with the listener's ears in a perfect triangle an so on. Nonetheless, I'm pretty satisfied with the result. They sound great on any kind of music: classical, rock, jazz, electronic. Very robust and no nonsense in the manual. There's even a block diagram and a frequency response curve inside. 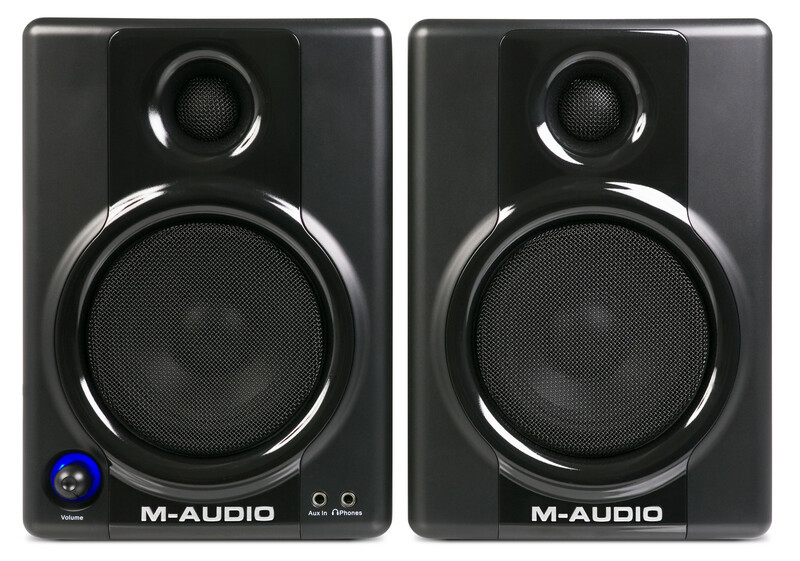 Update: you can find more or less the same info on M-Audio website. Very clean, unsaturated, natural sound. Great frequency response (85 Hz — 20 kHz) without a subwoofer. 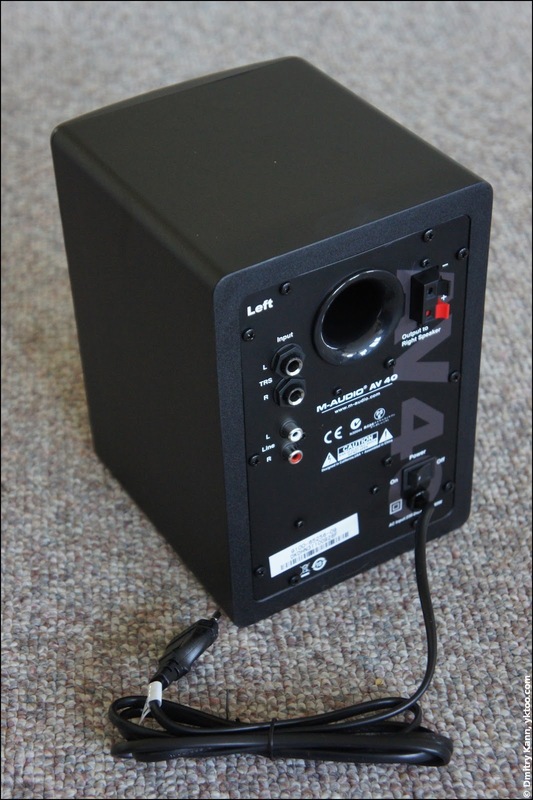 Compact and powerful at the same time (15 watts continuous is more than you'll need on your desktop). Auxiliary input and headphone output on the front side. Balanced input to hook up with a mixing console. 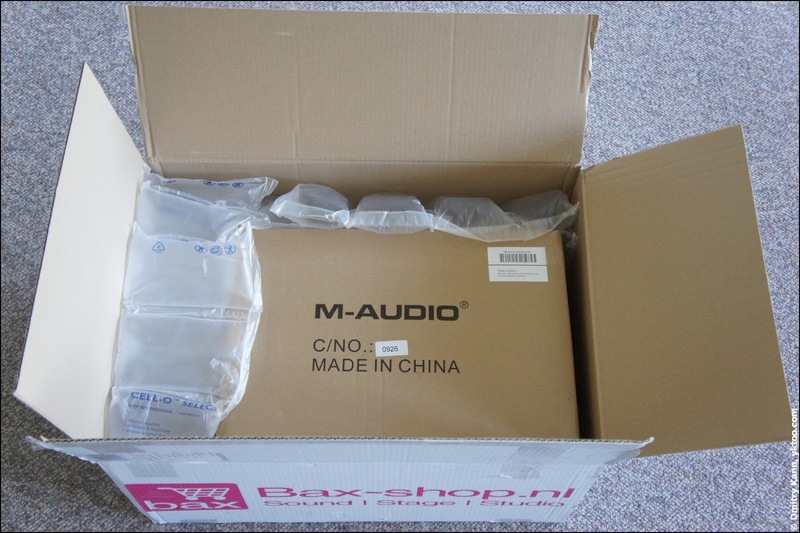 A famous make and, consequently, high quality assembly. Good price for the above. Power switch is at the rear side which may not seem handy. 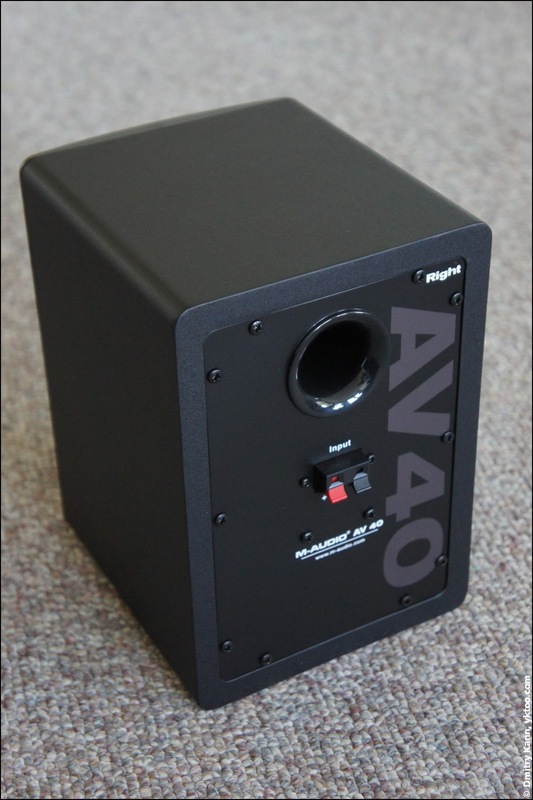 No sound equalisation available (which is not an issue for studio monitors, but some people may need it).